Dayr al-Balah R. Camp - Where is Dayr al-Balah R. Camp Located? One of the Villages/Cities of Gaza District, find here important information and profiles from Dayr al-Balah R. Camp. Where is Dayr al-Balah R. Camp Located? 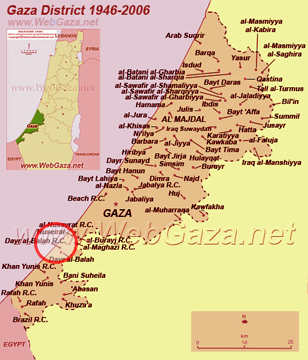 Dayr al-Balah R. Camp is located in the southern part of Gaza District, northwest of Dayr al-Balah, as shown on the map.